Translated from Spanish by Madeleine Brink. Edited by Helaine Schweitzer. The family of Anthony Kerrigan keeps a collection of letters he wrote to three generations of Spanish language authors, from Cela to Bellow, from Borges to Gil de Biedma, in Mallorca. He was their friend, as well as their translator. He gave voice to three generations of Spanish-speaking writers, and he was an ambassador of their work, always ready to help them move beyond the enclosed, gray national spaces of the Francisco Franco dictatorship in Spain. Anthony Kerrigan (Massachusetts, 1918 – Indiana, 1991) was an American who was born to Irish immigrants and spent his childhood in Cuba. He would go on to translate some of the most important works of many famous authors, including Miguel de Unamuno, Pio Baroja, Ortega y Gasset, Benito Pérez Galdós, Camilo José Cela, Jorge Luis Borges, Pablo Neruda and Reinaldo Arendas. Kerrigan and his wife, Elaine Gurevitz, made a brilliant couple. Authors like Julio Cortázar, Ana María Matute and Jaime Gil de Biedma, who wanted to move into the English-speaking world, came to them. Kerrigan moved to Mallorca in 1956, thanks to a scholarship from the Bollingen Foundation to translate Unamuno’s complete oeuvre. Now, 28 years after his death, Kerrigan’s family has begun to inventory the part of his enormous correspondence that was not donated to the University of Notre Dame, where Kerrigan taught. In the family’s mountain of folders there are hundreds of letters, manuscripts, cards, newspaper cuttings and photographs, all reflecting Kerrigan’s expansive network of contacts and friends. In addition to the names already listed, he also maintained contact with Pablo Picasso, Joan Miró, Antonio Saura, Dionisio Ridruejo, Américo Castro, Aranguren, Julián Marías, Carlos Barral, Jaime Salinas, Italo Calvino, Saul Bellow, John Dos Passos, Cynthia Ozick, Alastair Reid and Herbert Read, and the list could go on. Among the papers, there is a copy of an FBI report on the young Kerrigan. He had wanted to fight in the Spanish Civil War among the ranks of the Workers’ Party of Marxist Unification in a group financed by the actor Edward G. Robinson, but the group’s intentions were frustrated when a comrade with a “strong German accent” alerted them that the Stalinists would kill them as soon as they entered Barcelona. Later, in 1950s New York, Kerrigan met Gurevitz, a woman with Russian Jewish heritage, a violinist and pianist who had studied with Carl Friedburg, who in turn had been the student of Clara Schumann. Kerrigan and Gurevitz travelled to Barcelona, Paris and Mallorca. In Paris, they had a daughter, Antonia Kerrigan, who is now a well-known literary agent. After their travels, the couple returned to the United States where they published poems in Poetry magazine while waiting in vain for the arrival of their friend Dylan Thomas. Thomas would never arrive – the Welsh poet had decided to beat his whisky-drinking record in the White Horse, the bar where he had gone at the suggestion of Ruthven Todd. Soon after his binge, Thomas would die at the Chelsea Hotel. The Kerrigans entered Spanish cultural life in 1956, starting with a poem written by Anthony for Cela’s newspaper, Papeles de Son Armandans, which had been founded by Cela around the time Franco was trying to reduce the effect of Spain’s isolation from the world, and the dictator and Dwight D. Eisenhower made a deal that allowed U.S. military bases to be established in Spain. Kerrigan had written a poem called “El Atentado Contra la Virgen del Piropo,” for a book about Picasso, which was censored. Cela, during lunch with the censor, and helped along by cognac and a sublime Havana cigar, said, “Modern poetry is dedicated to the idea that poetry means nothing.” Soon thereafter, the ban on the poem was lifted. Later, Picasso did the cover illustration – a portrait of Kerrigan – for the American’s book, “At the Front Door of the Atlantic.” For the Spanish artists, Kerrigan was essential to their international reputations. Kerrigan translated Cela’s book, “The Family of Pascual Durate,” into English and provided international contacts for Cela’s work. Barral proposed to Kerrigan that they create a commission to oversee the translation. The group would include, “[t]he book’s translator, you, along with Jaime Gil de Biedma who is a translator, you know, who is excellent with Eliot and certainly the most brilliant Spanish writer who understands English deeply,” and “a person designated by a British group of Joyce’s friends, by a British association of writers, or by a university, au choix de monsieurs les héritiers.” Kerrigan, Irish like Joyce, was enthusiastic. He proposed Mario Vargas Llosa as translator and Anthony Burgess as a member of the editing committee. He also tried to convince Liam Miller, an editor at Dolmen Press, to form part of the committee along with Barral. The whole idea, though, was frustrated when they found that the owners of the copyright, The Society of Authors, were bound by a previous contract. Kerrigan was also Bellow’s neighbor in Chicago during the 1970s. His name appears in Bellow’s book “Ravelstein.” In one letter, Bellow corrects a former missive in which he had attacked Kerrigan for an article Kerrigan wrote for Commentary. In his article, the translator laments that the Swedish Academy had passed over Borges, awarding prizes to less valuable writers. Bellow, who won the Nobel Prize in 1976, was furious. But later remorseful about his harsh remarks, he wrote to Kerrigan to tell him that he felt himself to be the victim of marginalization from neoconservative magazines like Commentary, whose editor-in-chief was Norman Podhoretz, whose wife Midge Decter was also a well-known author there. Bellow took the chance to make fun of the sociologist Edward Shils (“shills and stooges”). Kerrigan’s love of snuff rubbed off on Bellow. 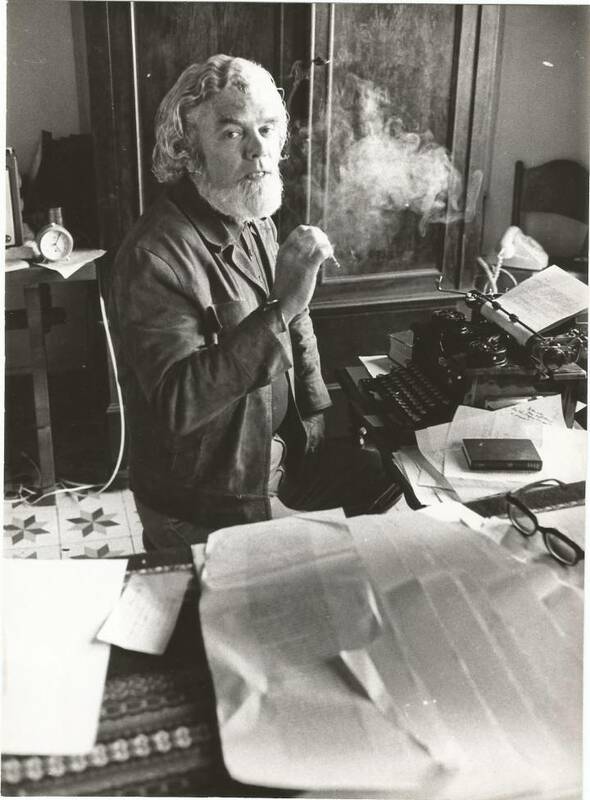 Those who knew the poet and translator still remember him with his untidy white mane and messy beard on drunken nights, removing a small red metal box with large white letters from his pocket. He would open it, pinch a bit of tobacco, and breathe a series of quick, dry breaths to feel the pleasure of its tingle. *Editor’s note: “Marielitos” is the name given to the Cuban immigrants who left Cuba from the Port of Mariel in 1980. **Editor’s note: Although accurately translated, this quoted material could not be independently verified.